AAA Innovations of Norwood N. J., is recalling about 275 cooler/grills. The wooden cabinet surrounding the grill can catch fire. This recall involves a wooden cabinet, and comes with a separate cooler and grill compartment. The grills are used as display enhancers in retail, liquor, convenience and other stores and may have been received by consumers as promotional giveaways and at charity auctions. The cooler/grill units measures approximately 35 inches high 44 inches wide and 16 inches deep. 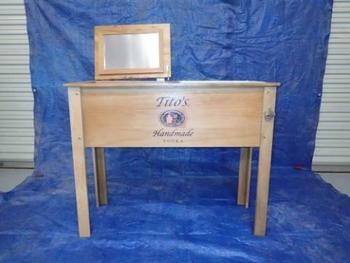 The words “Tito’s Handmade Vodka” are inscribed on the front of the product. The cooler/grills, manufactured in China, are used as display enhancers in retail, liquor, convenience and other stores from June 2016, through September 2016 and may have been received by consumers as promotional giveaways and purchased at charity raffles after that time.